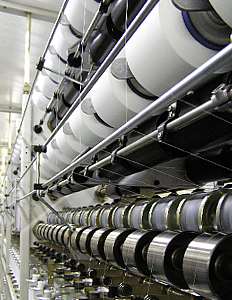 The conventional covering process can be defined as the traditional method of manufacturing elastic yarns. Today, the Fein-Elast Group has more than three hundred state-of-the-art covering machines on which single and double covered yarns are produced. In this process, the elastane fibre drawn at a constant factor, is fed through a hollow spindle and covered with a covering yarn from a flanged bobbin. Its characteristics, in particular elongation, elasticity and look, depends on defined parameter of the draft as well as on the turns per metre and the covering yarn selected for the process. All kinds of known filament, staple and high-tech yarns with an elastic core made of elastane or rubber are used. Our covered yarns find their application mainly in the fashion sector for hosiery, bodies and seamless articles as they give the finished product a transparent look, outstanding durability and a smooth appearance with a luxurious touch. Due to the greater demand for comfort and well-being, our covered yarns are increasingly sought-after in the area of medical products, sock manufacture and weaving.